Yes 4G is now offering the Samsung Galaxy S7 edge for a staggeringly affordable price of RM799. Samsung Malaysia’s current suggested retail price for the S7 edge is RM3,099, that would mean Yes’ price for the smartphone is 74% off. 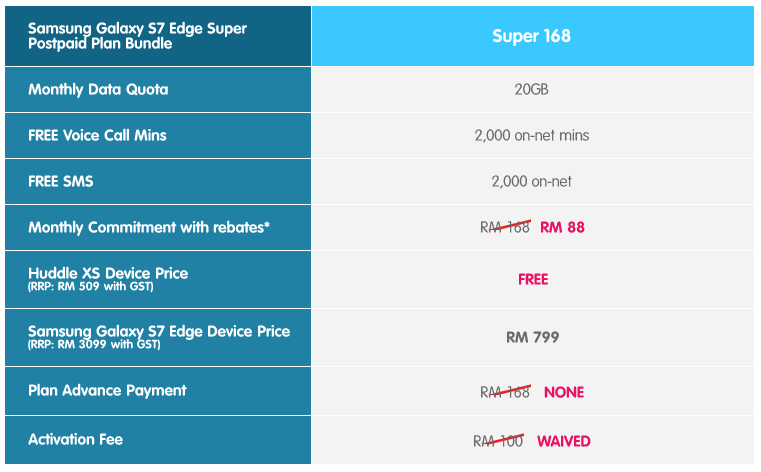 Customers will have to subscribe to Yes’ Super 168 plan but instead of paying RM168 a month, customers will only need to pay a promotion price of RM88/month. The plan comes with 20GB of data, 2,000 minutes of on-net calls, as well as 2,000 on-net SMS. Not to mention customers will also receive a Huddle XS and a 32GB microSD card for free, with the original activation fee of RM100 waived. That said, to subscribe to this plan, customers will be tied to a 24-month contract with an upfront payment of RM1,888. However, the payment will be returned as a monthly rebate over the contract period. This brings the total registration fee of the plan to RM2,687 – which includes the cost of the Galaxy S7 edge. Currently, this is the highest amount of mobile data offered at 20GB/month. The upfront payment might be a bit daunting to some, but it’s quite affordable considering the device and plan you’re getting. To learn more about the Samsung Galaxy S7 edge on Yes 4G, head on to the official website here.